Young Sydney woman Reme Sakr risked her life to travel to war-torn Syria in an attempt to convince her father to return to Australia. Chris Ray charts her journey. The slight young Australian is boarding a dilapidated long-distance bus on the outskirts of Damascus, steeling herself for the perilous journey ahead. Syrian friends have begged her not to go. But Reme Sakr has travelled from Sydney, determined to seek out her father. Reme has wrapped her slender frame in a tattered, bulky snow jacket, old blue jeans and heavy boots. Protection against the icy mid-winter wind is not her only aim: she has forsaken her usual stylish dress sense in order to blend in with other passengers. 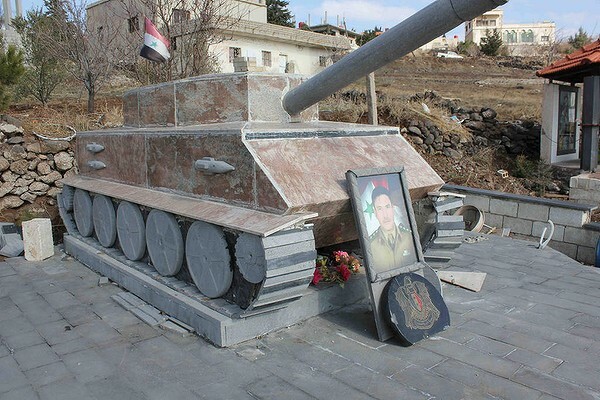 Southern Syria’s wartime “no man’s land” is no place to stand out from the crowd. Hidden inside the leg of her left boot is a letter of safe passage – signed by a senior Syrian government official and stamped with a ministerial seal – to get her through army checkpoints. What if rebels ambush the bus? “Destroy the letter – eat it,” a government official tells her. Reme’s father, Malek Sakr, painted houses in Sydney’s western suburbs for most of his adult life. 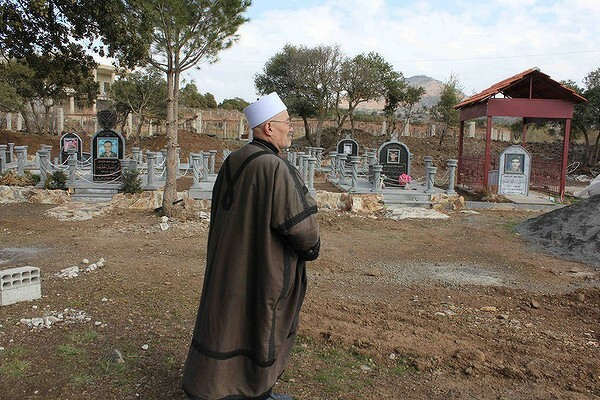 Five years ago, when Syria was still peaceful, he retired to the village of his birth in the hills near Sweida, a sleepy provincial capital 120 kilometres south of Damascus. Now Syria is engulfed by a war that has taken at least 100,000 lives and left three-quarters of the population in need of humanitarian assistance. After three years of carnage, there is no end in sight. Every day seems to hit new lows of cruelty and degradation. Reme, 26 years old and in her final undergraduate year at Sydney’s University of Technology (UTS), is fixed on persuading her father to come back to safety in Australia. Malek is approaching 70 and Reme, the fifth of his seven children, is alarmed by news that fighting has reached the fringes of his village. Reme looks like a local and her Arabic is fluent, but she has no Syrian identification card. An Australian citizen would make a trophy hostage, so Reme has been left off the bus passenger list for fear that an informer at the depot could alert rebels operating along the highway. The driver tells Reme to sit up front, where he and the conductor can keep an eye on her. Reme senses they are wary of her presence: officials from the Ministry of Higher Education seeing her off at the depot have taken a shine to this feisty yet vulnerable young visitor, and have left the bus crew in no doubt that they are expected to look after her. The road towards Sweida curves like a scimitar across a fawn-coloured plain encrusted with patches of pale-green desert scrub, a few stunted trees and the occasional Bedouin herding goats and sheep. The first of seven checkpoints is a sandbagged bunker adorned with posters of a resolute-looking President Bashar al-Assad. Nine months earlier, Syrian media reported, it was at a nearby settlement that “terrorists” fired on the Damascus-Sweida bus, killing two passengers and injuring others. A soldier in camouflage uniform boards the bus, but is interested only in the ID cards of male passengers. On the move again, the driver puts his foot to the floor in the hope that speed will foil rebel snipers. It is only then that Reme telephones her father. It is a call she has both long-awaited and dreaded, because Malek has no idea she is even in Syria. She kept the journey secret because he would have forbidden her to come – and she did not wish to defy him. Reme and Malek are Druze, members of what may be the most obscure and secretive of Arab minority religions. Numbering about 1.3 million worldwide, the Druze are concentrated in mountainous pockets of the Levant – those countries to the east of the Mediterranean Sea. Sweida is a rarity – a province in which the majority of the population is Druze. An 11th-century offshoot of Shiite Islam, the new creed took inspiration from the Koran, Torah and Bible along with elements of Greek philosophy, including belief in the transmigration of souls. Access to religious texts – collectively known as Kitab al-Hikma (the Book of Wisdom) – is forbidden to outsiders and even uninitiated Druze. Such eclecticism and secrecy aroused harsh persecution over the centuries, and continues to scandalise fundamentalist Islam. Poverty in Sweida forced Malek to find employment as a migrant labourer across the Middle East before landing in Sydney in 1971 at the age of 26. He was alone, had $200 to his name and spoke no English. But he was strong and work was plentiful. Then he discovered Sydney’s tiny Druze community and his new home started to feel a little less foreign. Druze are connected through their belief in human-only reincarnation and prohibition of conversion and intermarriage with non-Druze. Joining the Druze of Sydney helped Malek settle and find a partner, Samia. They married and raised seven children. Hers was a frugal childhood, Reme remembers. “Dad was sending money home to support brothers and sisters in Sweida. We wore hand-me-downs, rarely went to restaurants and never had a family holiday.” Her first real holiday was at 21 – a P&O cruise with her mother and sisters. Druze women enjoy considerable equality in marriage and may hold high religious rank, and the veil is generally confined to funerals and religious ceremonies. However, Reme’s upbringing was strict by Australian standards. “The basic rules were no boyfriends, and you must marry a Druze,” she says. When 19-year-old Reme went to her first nightclub with her older sister, Julia, Malek got wind of it and set out in furious pursuit across town to bring the girls home. One day a boy spotted Reme in a car park and left his phone number on the windscreen. “He got a call from Dad demanding to know, ‘Why you look my daughter?’ ” she recalls with amusement. Returning to Sydney meant more anxiety over language. Reme’s English was judged inadequate for year 10, and she and her younger brother found themselves in an ESL class with migrant kids from Villawood Detention Centre. She went on to Chester Hill High, then started a science degree before switching to journalism at UTS. After Malek retired, he and Samia separated and he moved back to Sweida. Reme thinks the isolation of Sydney’s small number of Druze left Malek increasingly feeling “like a stranger” in Australia. Retirement was a chance to seek a greater sense of community engagement and religious connection in his homeland. State-owned Syrian Air is the only carrier still operating commercial flights into the country – Western sanctions and the war scared off every other operator long ago. The national airline makes the Dubai-Damascus run twice a week, and on this flight the battered Airbus A320 is crammed with Syrians weighed down with treasure from Dubai’s malls. There hasn’t been a tourist for two years, so people are staring at the English speakers on the flight. A girl in the seat in front can no longer contain her curiosity: “Why are you going to Syria? Don’t you know there’s a war going on?” Reme’s answer is deliberately vague – something about meeting friends and staying clear of the fighting. “Nowhere is safe,” the girl replies. All aircraft lights are extinguished for descent in the pre-dawn darkness: the Western-backed, anti-government Free Syrian Army has threatened to shoot down civilian aircraft and East Ghouta, one of the main rebel concentrations around Damascus, is not far away. Damascus International Airport shows rocket damage to minor buildings but the main terminal is intact. There has been a snowstorm and outside is bone cold and slushy grey. It doesn’t get any brighter along the airport highway, where an unbroken line of barricades separates the road from low-rise apartment blocks pulverised to grey rubble. Closer to the capital, traffic waits in long lines at fortified checkpoints festooned with portraits of al-Assad and, occasionally, of his ally Hassan Nasrallah, leader of the Lebanese political and paramilitary organisation Hezbollah. Government offices are shielded by concrete blast walls painted in the red-white-black of the Syrian flag. There are signs of pre-war normalcy, however: university gates thronged with students, old men playing backgammon at footpath cafes. Reme is staying at a hotel in the heart of the “Square of Security”, a collection of inner suburbs said to be firmly under government control. Even here there is no forgetting the war; the thump of artillery aimed at rebel positions is almost uninterrupted. An Australian “solidarity delegation” of academics and activists opposed to Western intervention in the conflict is visiting Syrian universities at the invitation of the Ministry of Higher Education. Reme has joined the group and will serve as their interpreter during her first week in Syria. She’s had no training and is nervous but doesn’t show it. She handles the to-and-fro of formal discussions with aplomb, chats easily with cabinet ministers, including Prime Minister Wael al-Halqi, and even meets President al-Assad, but her encounters with ordinary Syrians have the greatest impact. Even with UN aid, Syria is struggling to feed and house the almost six million homeless who have sought refuge in government-controlled zones. That’s a quarter of the population and more than twice the number who have fled to camps outside Syria. It’s a crushing burden for a second-tier economy with a GDP somewhere near Sri Lanka’s. At a Damascus emergency relief centre, hundreds have gathered on a rumour that food parcels will soon be handed out. Dressed formally and looking like someone in authority, Reme is a magnet for a crowd of women and children desperate for food. Only days before setting off to meet her father, Reme embarks on a nostalgic shopping trip through the cobblestone lanes of the World Heritage-listed town of Old Damascus. 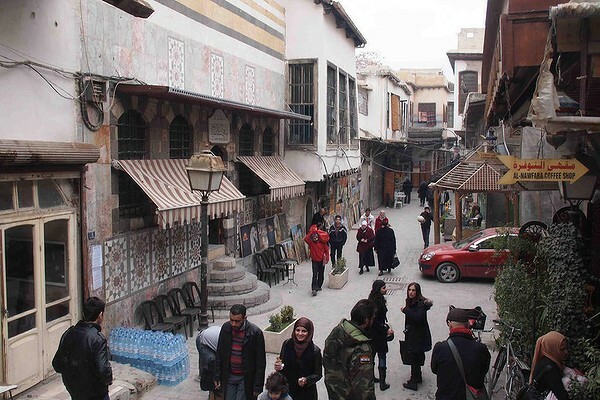 Exploring its labyrinthine alleys was a highlight of Reme’s schoolgirl years in Syria, but the civil war has sent commerce into decline: many of the tiny stores are shuttered and the crowds of shoppers and pilgrims have thinned. 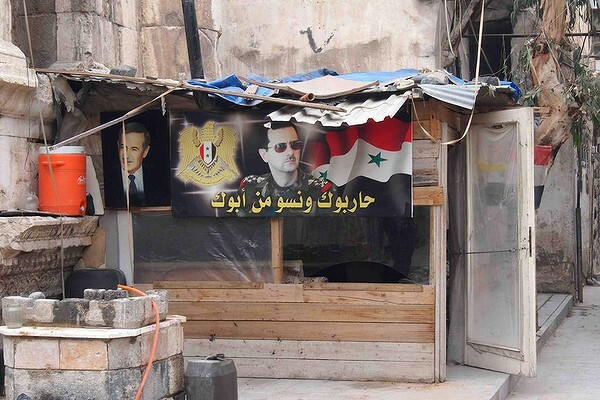 Stalls selling Syrian flags, scarves in national colours and badges of the president do a brisk trade, however. Militiamen guard checkpoints at the old town’s seven ancient gates. Notices hailing the sacrifices of “martyrs” plaster the high walls of its terraced houses, Ottoman palaces and caravanserais (large inns). 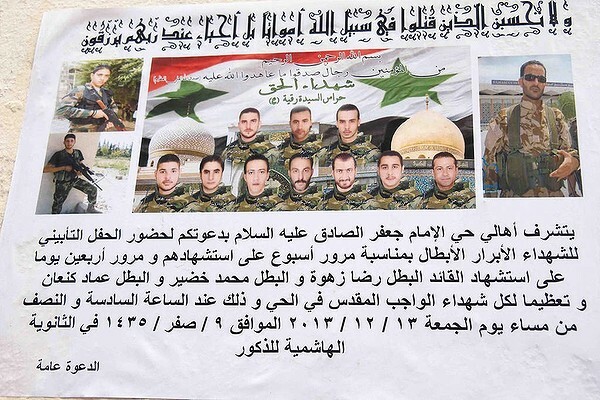 These young men fell in the ranks of the secular Syrian army but their beliefs are proclaimed in death: each is pictured with the symbols of his religion – a crucified Christ here, the dome of a Shiite shrine there. Reme is shopping with two new friends, Rana and her fiancé, Samer. Rana is a follower of the Shiite branch of Islam, while Samer is a Sunni Muslim. Marriage between religious groups in Syria was not uncommon before the war, and Samer and Rana challenge the view that the conflict is essentially sectarian. Samer scoffs at the notion that the Sunni majority is rebelling against President al-Assad’s minority Alawite sect, which is claimed to dominate the armed forces and security establishment. “Most of the army and most of the government leadership is Sunni,” he says. Top Sunnis include the vice-president, prime minister, ministers of defence, interior and foreign affairs, and the head of the Political Security Directorate, one of the country’s four intelligence agencies. Reme is in a sombre mood. Fighters from the Islamic fundamentalist Ahrar al-Sham movement have declared the Damascus-Sweida road a military zone, seeking to isolate the south from the capital. Officials from the ministry have urged her not to travel to Sweida. At lunch in an elegant old Damascene courtyard restaurant, over bowls of fatteh – a local specialty of yoghurt, soaked bread, chickpeas and olive oil – Samer and his elder brother Mazen, an accountant, deliver a blunt warning: Reme could be killed, raped or held for ransom. “Terrorists will see dollar signs if they hold up the bus and find out you are Australian,” Samer says. Reme has made up her mind to go. With the sound of explosions and gunshots near the hotel, she tries to phone her family in Sydney, but can’t get through. “I’m feeling a bit emotional. I need to tell someone what’s happening here,” she says. In particular, she wants to talk about her conversations with a girl of 21 – who happens to be a Sunni – forced to flee her home in rebel-controlled Aleppo because her online activism against the insurgents earned a death threat. 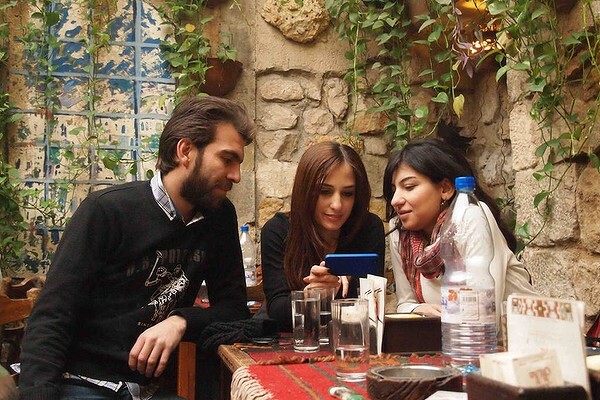 On Reme’s last night in Damascus, she goes to a bar with friends. There’s Arab and Western pop blaring, but the only tune that gets everyone on their feet, dancing and clapping, is a patriotic song for the Syrian army. From the bus window, the Druze homeland is glimpsed as the snow-powdered peak and black basaltic flanks of sacred Mount Shihan. Reme recognises it immediately; Malek took the family up there to sacrifice sheep during Eid al-Adha, the Abrahamic Feast of Sacrifice, which Druze share with Muslims. Mount Shihan is one of a series of heights along a southern volcanic massif collectively known as Jebel al-Druze – Mountain of the Druze. This is where I come from, Reme thinks. She’s finding meaning in this place. She never thought much about it before; it was just somewhere her relatives lived. Reme’s heart is pounding as Malek answers the phone. He’s stunned and excited to hear her say she will be in Sweida that afternoon. His voice reveals no anger, only worry for her safety. He rushes to his car to be at the bus depot on time. Reme and Malek cry as they embrace. They separate and hug again. Malek is stocky, with permanent grey stubble and the obligatory moustache of the Druze adult male. He wears an ankle-length grey woollen cloak over black vest and pants and a round white cap with a flat red top – a symbol of religious rank. This feels like a dream, he tells Reme. He never imagined any of his children would visit during the conflict. Malek’s village, Hazem, is approached through olive orchards and fields of bare grapevines. Sheep feed on denuded hillocks. High walls of black volcanic stone encircle concrete-block cottages, which here and there give way to gaudy white mansions. There is no electricity today: rebels have blown up the gas pipeline to the power plant. The next day is spent with two relatives, Abu Said and Abu Salim, grey-bearded patriarchs who remind Reme of Tolkien’s hobbits. They can’t stop staring and smiling at Malek’s Australian daughter, who’s peppering them with family questions. The conversation shifts to the war and Reme learns that, like most Druze men in Sweida, Malek has acquired a weapon. He joined other villagers to defend a neighbouring Druze settlement three months earlier. Hundreds of rebels – “men with long beards and no moustaches”, as Malek describes them – attacked the village of Dweire, 20 kilometres away. A Druze leader activated a phone tree to summon help. Malek grabbed his AK-47 and drove to Dweire in his black Kia sedan. 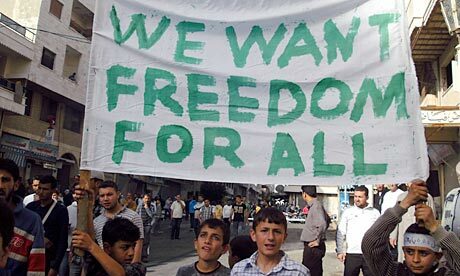 The attack on Dweire came from the south-western province of Deraa, the cradle of the Syrian uprising in 2011. Rebels in Deraa, including the notorious jihadist group Jabhat al-Nusra, resolved to bring the war to Jebel al-Druze in late 2012. Rebels have abducted hundreds of Druze civil servants, policemen and ordinary citizens for ransom or to trade in prisoner swaps. Rebel snipers create deadly havoc for Druze farmers along the provincial border. A car bomb dispatched from Deraa killed 34 people and injured 41 in Sweida city last November. Though Syria’s secular administration does not collect data on religious affiliation, the Druze are thought to make up about 3 per cent of the population. Acutely aware of their vulnerability, they have managed to keep a low profile without openly declaring for one side. However, they clearly fear religious fanaticism more than the depredations of an authoritarian state. Talk in Malek’s house turns to the fate of Druze in the Idlib region of northern Syria. There they have suffered the resurrection of the dhimma, an historical concept referring to the restricted status of non-Muslims in an Islamic state. In Idlib, Malek says, the Islamic State of Iraq and the Levant, an al-Qaeda-linked group, gave the Druze three choices: convert to Islam, pay the jizya – a tax on non-Muslims basically abolished in the Middle East by the late 19th century – or leave minus their possessions. “These people want to establish an Islamic emirate,” Malek says. They want to ignite a sectarian war and drag the Druze into it. Moreover, he feels useful in Syria because old people are expected to lead community activities in traditional Druze society. “What can I do as a retired person in Australia? Go to the pub or play lawn bowls?” he asks. Barely a day passes without Malek, in his capacity as an Uqqal, attending a funeral for a “martyr”. He estimates that 1200 Sweida Druze have died while serving in the Syrian army since the war started in 2011. Reme stays too long visiting an aunt and it’s dark when Malek finally gets her into the car for the drive home. He is annoyed at their late departure and mutters something about roadblocks. Half way to their destination, at the foot of Mount Shihan, Malek slows unexpectedly. He produces a sleek, black, semi-automatic pistol, which he primes and puts beside him before accelerating to 120kph. She is full of admiration for Malek and wishes he had mailed the letters. Malek had only two years of schooling, but Reme is struck by his eloquence and wisdom. As one of the three highest spiritual leaders of the Druze, Sheikh Hammoud al-Hanawi bears the title Sheikh al-Aqel. “He is like the Pope of our people. His authority extends to Druze in Sydney,” Reme explains. Having accepted Malek’s invitation to lunch, Sheikh al-Hanawi is sitting in his reception room, a spacious rectangle with brown, velvet-covered seats fixed to the walls, under photographs of local worthies including Reme’s grandfather. It would be improper for a man of his status to be in the company of an uncovered woman, so Reme dons the footah, a white, semi-transparent veil worn lightly over the hair and shoulders. Knowing that tradition requires a guest be fed meat, Sheikh al-Hanawi has agreed to come on the condition that lunch is kept simple: bread, olives, yoghurt, and cheese – nothing that requires cooking. Malek agrees but can’t let the Sheikh al-Aqel go without meat. He produces a tray of kibbeh nayyi – raw lamb, bulgar wheat and minced onions. Reme is taken by surprise when Malek tells her to go upstairs so the two men can pray. Sheikh al-Hanawi says she doesn’t need to go upstairs, just far enough away so she can’t hear what they are saying. “They believe I haven’t distanced myself from the temptations of life and only those who have committed themselves to the religion can know its secrets,” Reme says. That evening, Reme learns that another sheikh has suggested to Malek that she might marry the sheikh’s son. There is little time for courtship because Reme is leaving soon. Malek is upset that she won’t delay her departure to meet the young man. Reme’s aunt has already scolded her for rejecting offers from two other suitors conveyed to her by email and SMS in Sydney. On her last night in the village, she looks in on Malek after he goes to bed. He is asleep with his Kalashnikov, pistol and torch alongside him. He suddenly seems old and frail, Reme thinks. She is both frightened for Malek and sad for Syria. By mid-morning the next day, after breakfast and a final photograph with Malek, Reme is in a minibus heading north to Damascus – the first leg of a long journey home to Australia. She sits opposite the driver, who is keen to chat, but Reme can only stare out the side window, trying to hide her tears.